Shoreline Industries, Portsmouth, was recently named recipient of the JSA Fiscal Year 2016 Outstanding Small Business of Year award. 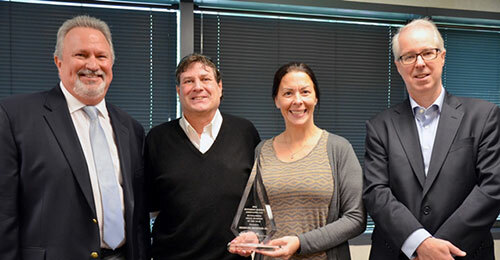 Pictured: Mike Hess (center, left), president of Shoreline Industries, and Tamela Gundran (center, right), Shoreline’s safety coordinator, accept the award from Jefferson Lab Director Stuart Henderson (right) and the lab’s Chief Financial Officer and Business Operations Manager, Joe Scarcello. NEWPORT NEWS, VA – Jefferson Science Associates, the operations and management contractor for the Department of Energy’s Thomas Jefferson National Accelerator Facility, presented its fiscal year 2016 small business award to a small construction services firm from Hampton Roads. Shoreline Industries, located at 1040 Virginia Avenue, Portsmouth, has been a subcontractor at Jefferson Lab for more than 20 years, during which time they have successfully completed a large number of projects for the lab. Jefferson Lab and Department of Energy managers recently presented the award to Mike Hess, president of Shoreline Industries, and Tamela Gundran, Shoreline’s safety coordinator, at a reception held at the lab. Suresh Chandra, a Jefferson Lab structural engineer, who has worked with Shoreline, nominated the company for the award and commented on their unique ability to meet the lab’s needs on a timely basis, highlighting their focus on customer service. In accepting the award, Hess, thanked Jefferson Lab staff for working with Shoreline throughout the years, and gave special recognition to Gundran, Shoreline’s safety coordinator, for achieving the company’s exemplary safety record. The purpose of the award program is to recognize the top performing small firms doing business with Jefferson Lab, according to Lloyd. Any small business, including women-owned, veteran-owned, service-disabled veteran, HUBZone, or disadvantaged business doing work for Jefferson Lab may be considered for the award. The lab has been presenting this award annually since 1991. Jefferson Lab is supported by the Office of Science of the U.S. Department of Energy. The Office of Science is the single largest supporter of basic research in the physical sciences in the United States, and is working to address some of the most pressing challenges of our time. For more information, visit science.energy.gov. Jefferson Science Associates, LLC, operates and manages Jefferson Lab for the Office of Science.